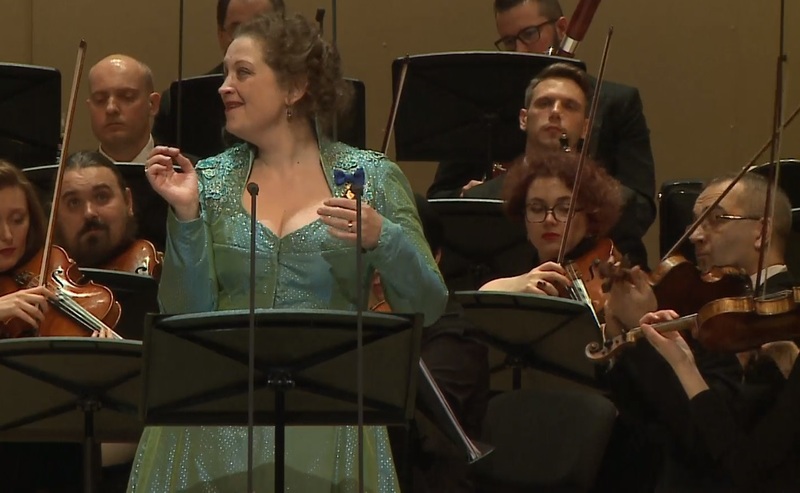 Right now: Ann Hallenberg in Moscow (mezzo arias) | opera, innit? Posted on February 3, 2019, in classical period, mezzos & contraltos and tagged ann hallenberg, christoph willibald gluck, gaetano donizetti, gianluca capuano, gioachino rossini, joseph haydn, mozart. Bookmark the permalink. 133 Comments. i listening!! already an improvement with an italian conductor, not the rigid human who kept shoving VK into certain tempo from 2012! hehe, that guy was very young, though. oh, and here i thinking i want to hear her in this opera! (which ever it is), something Haydn? Yes, Haydn – Il ritorno di Tobia. Remember my post Everything is better with contraltos? ps: I think it’s a bit low for her. damn.. you know how i hear 1 aria from certain signer and it triggers the need to listen to the entire opera to see how it fits in?! agreed. This is the Baroque Gluck, with the trills and whatnot. Quite suited for her. yes, the entire Tobia is on YT. Remember my AH wonderful in Gluck and Mozart? She is really good in the rep.
jeah, i have that post opening just next here..
ps again: I predict she will sing Deh, per questo (Sesto’s aria is a bit misleading 😉 ). Let’s see how right I am. oh it ends, here comes A.Hallenberg again, yay..
damn, already weeping 2 phrases in. she has not sung Sesto? I don’t know but she can do it any time she wants! She would be wonderful. jeah, and Gluck. in Amsterdam. well, this was just great, really unforced. though I wonder how idiomatic she is in the Rossini stuff. I’m so used to her and to things earlier than 1800 that it’s hard for me to comment if this isn’t Rossinian enough (as I have seen some comment on YT). i thought Isabella was super fun, somehow she seems to be a singer who can make everything work in her own way. yes, she really seems she likes Isabella (and who wouldn’t?!). That’s how I feel too, about her singing, she’s intelligent, super skilled and so likeable in personality that it’s really hard to be curmodgeonly about her. Nevertheless, old skool opera fans can! Didn’t Prina once say if all her audience was pleased with a performance it probably hadn’t been a very exciting one? Although you really must be very ill-tempered to not like Hallenberg. It is true her Arsace is comparably light-weight but variety is a good thing! Hehe, even she was only practically perfect, no? it would actually be funny to have her play Isabella as a sort of Mary Poppins (in the sense of always being positive and killing them with kindness 😉 ). And yes to the umbrella! it’s definitely its own thing. I think a lot of times conductors vary it due to whichever way the production goes. Orphée !! en français! melikes! that is a massive pest of an aria, eh, with all the exposed stuff – remember how tired VK was as well? ah hihi, i can hear now, tune to l’Italiana in Algeri in practice! Thanks for the reminder! Too bad, I only switched in during the break, but now there she is finally. I think you can go back to the link and watch again at a later time. At least right now that is working for me. we should have some cutout “typical Baroque/Romantic/Comic” scenery to put on for concert performances. you missed some nice Gluck! but i have you covered..
now she’s on a different dress, and i forgot what Dehggi said about her Isabella in the past.. but i like her Rossini, Baroque’s style! Yes, we can forget about my Rossini comments 😉 Cruda sorte was a blast! don’t we all! That is such a fun role. I don’t know this opera at all. Mournful stuff for sure. that’s 19th century heroines for you, women without agency. that’s why we skip over that part of the repertory 😉 also because mezzos are only given maids, old women or witches and there are too many tenors per square meter. and i was just thinking how i’d introduce Juditha to friend who took me to see Otello: you see, in this (early) period, she led her people, and chopped the head of the bad guy’s off. no way. not when compared to strangled to death! and yet if they find that “normal”, we have to tell them what should work the other way! I think they would say “women acting violent is worse”. As if women should just take it lying down. that’s ok, i won’t waste too much time explaining anyway. hahaha! he’s evil like that 😀 and always coming back to sing some seductive arias, too! Harteros was the Verdi version of the Willow Song and this is the Rossini version? endured, eh? I cpuld not get past the overture. I did not see where the action could get any angstier. it was a trap! Hehe. is there no overture? Whatever the beginning is called. It seemed already too energetic to me. might’ve been the Verdi version? It’s the same (stupid) story. ahhhhh, i get it now, this is Rossini’s version, hahaha. the one thing I (we?) remember from that production with JK. Leonora, yes. I was wondering if she initially thought to sing it and then changed her mind. Because why have this overture and not Semiramide’s since the aria is coming up?! it’s quite a serious aria, i esp. like it in French, VK of course sung the role a few times, in production too i believe. I was thinking the conductor and orchestra not up to Semiramide’s overture? it’s 20 min! and you really need to feel it and have spontaneity! on the other hand, it’s a well known overture and orchestras have probably encountered it in the past. The time limit might be an issue, you’re right. I would have loved to see VK in La favorite. ah! interesting choice of aria! yah!! too bad chorus missing!! WE NEED CHORUS for this aria!! …I’m tempted to sing the chorus myself now. phew, just got back in time, she said something? and now encore! I have to say, I’m not even a big fan of this aria but she is just wonderful. she may be coming back again. She just said “Gluck” hehe. Hope the dinner is not overcooked now, but worth it! and now the angry emoticon not working, whatever, i got back now, lots and lots of clapping..